Houseki no Kuni / Land of the Lustrous season 2 release date, last news, review. | Anime & TV series Release date. New season review. Japanese anime Land of the Lustrous, a series created based on the eponymous manga. The first season premiere took place on October 7, 2017. At the moment, 12 series are released. What for you can love this anime? The “Land of the Lustrous”, is a bit gloomy, but in its fairy tale about the beautiful and peaceful creatures living on our planet in a distant future. Unfortunately, their race is not the lonly one in the world of future, because the gems are forced to fight for their existence. The Moonreys, the people of the moon, have been hunting them for centuries. Gems for them are just treasures, whose life costs nothing. Over the centuries of struggle, the gems have even managed to learn to anticipate the attacks of terrible monsters, but they still remain helpless before the threat. 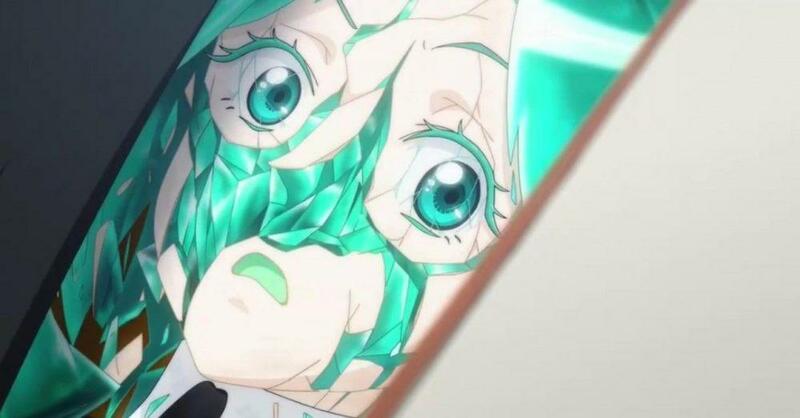 At the center of these events is the main heroine Phosphophyllite, a young crystal trying to survive in this terrible world. The main heroine personifies the changes, that’s why we, as viewers, are so interested in watching the development of her personality. First, a naive self-confident character, she becomes self-sufficient self-confident heroine. At the same time, changes in her character make the world around change. During the series as a beautiful reference to the inner changes of the main character, changes are also shown external. Replacement of parts of the body and loss of memories for the main character – a kind of parting with the old self. This anime is not just an interesting story, plus a beautiful picture, there are also quite a lot of bright images of characters, and deep ideas. In the main heroine you can see a certain catalyst, which makes to change the world around. Rather, it is even a spark of freedom, of revolution. To be or not to be the second season? It is a pity that all the good things, comes to an end. The first season has come to an end, and many fans around the world are wondering if there will be a sequel? Some believe that the main character is a self-contained, completed character whose “artistic path” has already been passed. Phosphophyllite emerged from point A, and arrived at point B. It can no longer change, and therefore it is static. Static characters are dead characters, they are not at all interesting to observe. A plus in the treasury of this theory is that one of the main highlights of the tayla is dynamism. The second side of the “conflict” thinks otherwise. We have repeatedly witnessed the unrestrained flight of fantasy of Japanese animators. Perhaps this anime has not yet exhausted itself. Most likely, new interesting characters will be introduced into the narrative, or they will show the development of the already existing characters. The country of gems, fortunately, is not limited to a single character. They are 28 only among gems! Another argument in favor of the continuation of the series, you can call it quite a good popularity. Many of us know that it is ratings that is one of the main evaluation criteria. We hope that the producers will also notice and appreciate these ratings. The last argument “to be” is the number of books of this manga. There are already 4. So, the anime story will be released in at least 3 seasons. Summing up the above, we can safely say – “Land of the Lustrous season 2”, most likely, will be! Upd. According to the director, Takahiko Kyogoku, 2 season is in work now. The premiere is scheduled for autumn 2019. A second season will totally make me happy ! Even if this date is not sure, it makes my day !